Inspired by the Makers Mart at the National Museum of Women in the Arts (NMWA), the Modern Makers series highlights local women makers and their diverse companies. 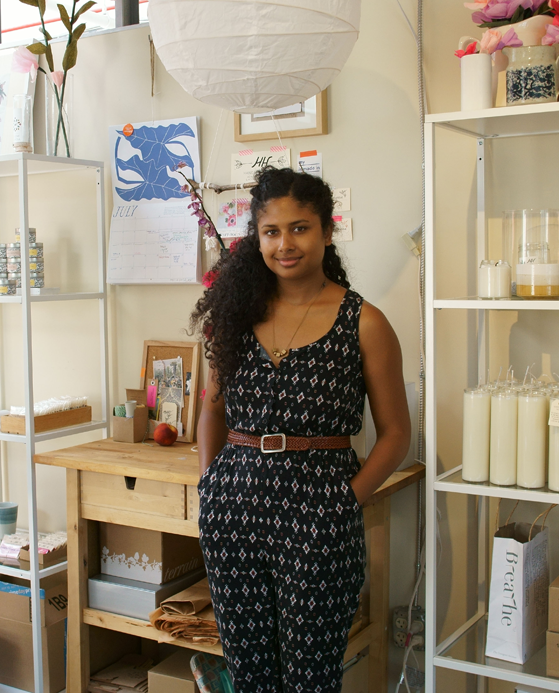 Artist and chandler Amina Ahmad owns Handmade Habitat, an all-natural soy-candle and beauty-goods company specializing in products that uplift and inspire the soul. Ahmad studied environmental science at the University of Maryland. Passionate about building the creative community in the D.C. metropolitan area, Ahmad is also the co-founder of the Unofficial Hand Lettering Society of Silver Spring. When not in her studio, Ahmad often strolls through her neighbors’ gardens in Takoma Park with her dog, Rosie. My business started a few years ago. I originally made bags and clothing. Then one year, I experimented with candle making for Christmas gifts. I ended up really liking it and started incorporating it into the existing business. I am inspired by nature. I am really inspired by artists and a lot of the other work that I see in the world. I’m also inspired by my own yoga practice, which helped me discover what I really value in my work. What does the creative process look like for you? I start with a concept—something that I want to incorporate into my own life. That’s how it has always been. I started making things that I wanted, whether it was a bag, a new dress, or oven mitts. What does the word “maker” mean to you? I think a maker has a really wide definition. . . . Making is a core part of my identity. I come from a very D.I.Y family. If there is a problem, you troubleshoot it first with whatever is available before you buy something to fix it. How do you see your company evolving? I think it would be really nice to be able to build a community around the brand that has a lot of the elements of presence, mindfulness, and artistic introspection. What is your favorite work from NMWA’s collection? Definitely Frida Kahlo’s self-portrait. I love that there is a Frida in D.C. . . . She provides a lot of power in her images. I think that the museum really shows that there is so much power in being a woman. What inspired the limited-edition NMWA product? While walking through the museum, I have the overwhelming feeling that femininity and art are not powerless. The works of art show that there is so much power in being a woman today and at every point in history. 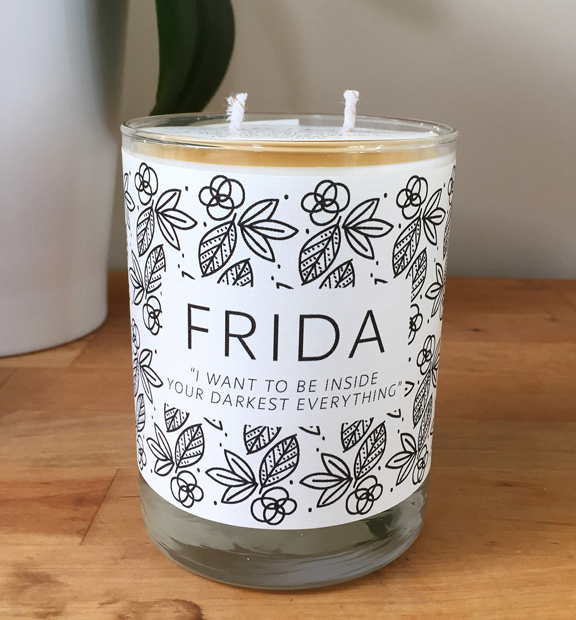 Browse products by Handmade Habitat on the Museum Shop’s website, including the limited-edition Frida Candle, inspired by NMWA’s own Frida Kahlo painting. Browse #NMWAMakers on Twitter to see more creations.